Thank you for helping us commemorate 150 years of informing, inspiring, and improving our community with these wonderful works of art. 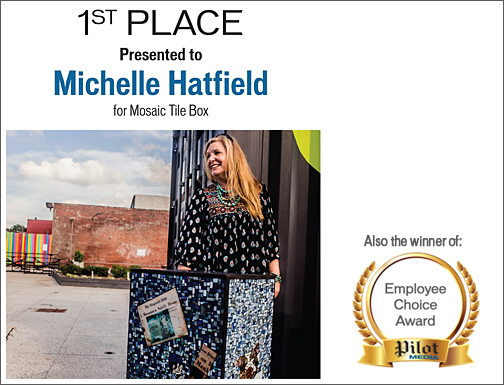 When considering her approach for the Art Outside the Box contest, Elizabeth City’s Michelle Hatfield found inspiration in the evolving news industry. “How over the years have we received our newspapers?” said Hatfield, a self-proclaimed Navy brat who teaches stained glass at the College of the Albemarle. “The newsboy, the child riding a bike and delivering it door to door, the loyal and loving dog bringing it in, and the present and future online delivery by tablet.” This evolution is brought to life in her intricate mosaic design. “I was trying to create realism, and futurism, with the online newspaper headlines,” Hatfield said. “First and foremost, I hope people who view my work see something beautiful. I like my work to hold your attention, that you keep looking and see something different every time.” One thing you’ll find in “Mosaic Tile Box” is a nod to Hatfield’s two bulldogs, Rhayban and Zeus. “The dog delivering the paper was my way of including a bit of my world into the art work,” she said. 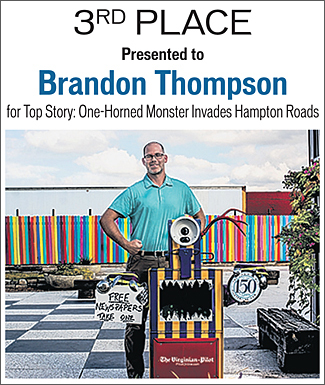 The material list for Brandon Thompson’s “Top Story: One-Horned Monster Invades Hampton Roads” starts out normal enough, with wood, acrylic paint, and spray paint, but then from there gets as wild as the design itself. Silverware. Oven burner cover. And---wait for it--real deer horn. “Being a mixed media artist, I wanted to use as many found/ common objects as I could,” said Thompson, a kindergarten teacher for Virginia Beach Public Schools. 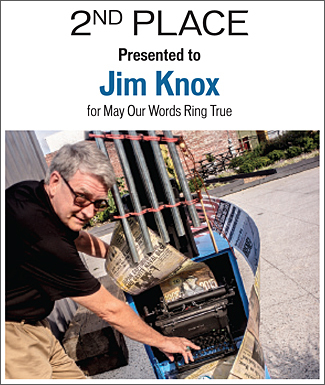 “I use a lot of bent silverware in a lot of my pieces so I had to do it with this piece.” While most of the artists who entered the contest viewed the newspaper boxes as canvases for their work, Thompson had a very different initial reaction. “It just screamed MONSTER,” Thompson said. “I just visioned this old newspaper box on the street. Someone goes up to it and gets ready to get a paper out of it and all of a sudden the box transforms into a monster and sends the patron running and screaming down the street.” Don’t worry, folks. None of the art bites.